504 Main by Holly Lefevre: It's a Wrap! (OK, on every eve) wrapping gifts. Not this year, I say!...and I mean it (I hope!). Now, wrapping gifts is not one of my favorite things. plus the thought of all that waste drives me insane. Me: "Joe, listen to Mommy's idea for wrapping presents! This is going to be so much fun!" Joe: "What Mom? Do we get to put candy on each present and eat the candy as we open them?" Me: "No...we are going to wrap them in newspaper." Joe: "That isn't going to be pretty." Me: "Yes, it will. Besides we will save money and we can recycle the newspaper." Joe: "Does that mean I get more presents if we save money?" Me: "No, but it means we will have a "green" Christmas. We can add pretty bows." Joe: "OK....but can we ask Santa to use regular wrapping paper so some of the presents aren't ugly." I am determined to win him over. So, in order to do that I have already started wrapping gifts. I am using newspaper. Nothing difficult there - actually the hardest part is to find pieces of the newspaper that do not have completely inappropriate or depressing stories on them, although I did wrap one in the stock market pages and some would say that is scary! To decorate the packages..so they are "not too ugly" (as per Joe's request)...I pulled out my craft goodies - tissue paper, trims, ribbons, glitter, letters, even Christmas ball. Almost anything will work and all of these items are reusable. Here are some of the creations. I am so excited to wrap some more. for Homecoming (in high school) would pay off eventually. I made a tissue paper flower and tied am ornament in the middle. Then took a small length of ribbon and attached it to the back. and the Coffee Bean and Tea Leaf's Mocha Powder. Lucky for me, the powder now comes in these great tins. and attached some cute trim. Chipboard letters, glitter, glue, ribbon, and string..voila! For the simple looks above, I just layered ribbons and trims. I used glue dots or cellophane tape for many of the projects so that the trim or paper (if necessary) would come off really easy, and I could reuse it again. Paper bags would work really well too, as would butcher paper. Joe's job on Christmas will be to pull off the tape so the newspaper can be recycled! This is not the first time I have had an idea like this! Back in the 80's (I think) when recycling was still "new," I asked (er, made) my parents wrap all the presents in brown craft paper so that we could recycle the wrapping paper - they have always been great sports when it comes to my (sometimes) crazy ideas! 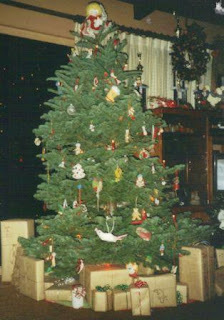 Here is a shot of our tree that year. And, yes, I was the one who got to take all the tape off. PS-Check back later in the week for gift tags! I think they are adorable! Such a great idea!! Such a great way to include the older kids! And being politically correct and green! I just might have to use this idea, blog about it and thank YOU! I think your gifts look fantastic wrapped in newspaper especially with the stunning and festibve bows! I have an aunt who is a nut about well-wrapped gifts, it's a little wierd, but she did teach me long ago how to wrap well. So I enjoy wrapping but some packages are difficult to wrap and some wrapping paper is difficult to use. But most of the time nice looking paper and great ribbon look good on a package and yours are wonderful! Super cute! Great idea... I might just have to use that idea! What a great idea! I can't wrap to save my life, so this may be something good for me to try! Those are fabulous...now where was this post LAST week when I was wrapping!! I have done this and I think it is a fun look. I have also used grocery sacks. Another option is to go to your local newspaper and they generally have rolls of ends...plain newspaper (no print) and it is inexpensive. I think they are cute! Holly, your ingenuity and creativity shows again. You know, I've thought of using newspaper but never actually did it. It would save money on buying wrapping paper, not to mention the green savings. I've already purchased wrapping paper and have most of the gifts done now. I can only imagine the looks I would get if I did this. Spending money on wrap drives me crazy also. I have for years always kept the sunday comics from the newspaper to wrap the kids presents in.. Kids love that. At christmas I am a saver. Boxes always get reused. I have some of those little boxes that christmas lights come in. I bet I have had some for 10 years. I make the kids give them all back. They are durable and makes me feel like I am helping the cycling cause just a little.So the motto at my house is don't think you are getting what is in the box wait until you open it.You never know. It also amkes for a good mystery present. ps. The boxes stack inside of each other for easy storage until they are needed. These are fantastic! I REALLY like the Joy one. awwwwwwww - I think it's a REALLY CUTE idea.....seriously! I wanna do my tree in black and silver next year and wrap all in black and white! with red bows! I think you're fooling us with the whole "I'm a HORRIBLE wrapper" bit. Those look professionally wrapped Holly! I love what you did to them! They look fantastic! I think you're doing a great job!! Wow. These are lovely. I think I'm stealing some ideas. What an original idea. As long as the ink doesn't come off, I think this is a totally unique way to reuse the old newspapers that are always laying around. I especially like how the black and white looks with the festive Christmas colors. Very pretty! Those brown paper wrapped presents don't look too shabby either! Wow Holly! Those are beautiful! You have such a great eye for design! I particularly love the tissue poppy! Inspiring! I like how it came out! With the ribbon, it really is as cute as wrapping paper! I said that I was going to wrap presents in newspaper this year, too. But mine wouldn't be that cute! I think yours turned out great! Your gifts look great! Sounds like you're having fun, too (always a bonus!). I'm crazy with gift wrap every year. I pick a color theme and all of the packages have to coordinate. Newspaper would be great for that. I could go with black, white and red. Love it! I remember using the Sunday comics also for kids birthdays. Those are soooo cute! I never would have thought of that. And it looks pretty. Wow, Holly, you did a fabulous job and good for you for recycling the newspaper. Can't wait to see the gift tags. Wow, very creative idea. My wrapping skills are lacking as well--I always use too much paper. That is a really great idea! And I love the ribbons you used. Simple yet beautiful...and green!! I love it!!! I think you are a Martha yourself....I love how those gifts turned out. I enjoyed reading your sons comments...hahah. Its funny how children think. We usually use blue and silver paper...cuz our tree is decorated in blue and silver...cuz that's my favorite Christmas combo...cuz it's pretty. However, this might work, too!!! Great idea....except I don't get the paper, I read it online, LOL! I love to wrap presents and OPEN them! Perfect! I'm the worst wrapper ever and I always wrap in newspaper but I still don't make them pretty... yours look so beautiful! Great ideas lady! I like the newspaper. We don't get the paper and have not for years. We read all the news on our phone. I have been using bags for years, and even setting up toys out in the open. We take it out of the box, and set it up near the tree. I love these! They look so beautiful and unique. Gotta give it a try. I love it. And the bows/accessories are beautiful and the perfect touch. Seriously. I am so excited---these are great!! Clever! I'm really liking the decorative can. This would be perfect for gift giving. I like your idea of using newspaper for wrapping gifts...when I was small it seemed like most birthday gifts were wrapped with the colored funny papers from the Sunday newspaper and nobody thought it was cheap back them or recycling. Thanks for becoming a follower too! See ya soon. I love the newspaper. My favorite is the "JOY" one. I actually had a boyfriend back in High school whose mom used to save all of the comics from the whole year and used them for wrapping presents, just used red and green craft yarn to tie them up. It was cute! Of course, I got birthday and Christmas presents wrapped in comics. But it was a good thought, a way to save money and trees! I love your idea! As for being green, my grandma NEVER used tape to wrap her presents, and we had to return the paper and ribbons to her every year. I can't wait to see your gift tags. This is such a great idea Holly! Cute too! Now if only we could make time for you to come to my house and wrap all my presents....=)! This is my favorite thing to do... wrapping presents!! You have a definite talent with design which I can see by these pretty packages. 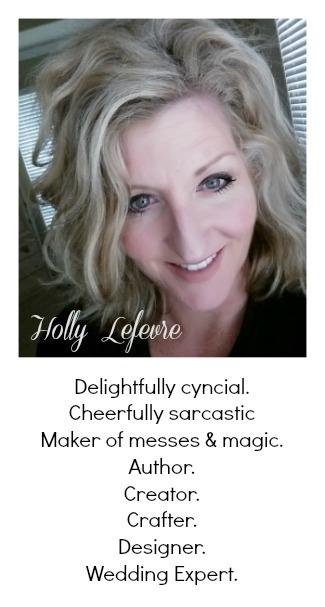 The blogger at LifeLoveLatte suggested I visit you, and I am following your blog now. I have 2 blogs, one of them is for the book I wrote on celebrating Christmas. I see you are an author too. Your little Joe is just adorable, but I think they look gorgeous. I'm having a giveaway for the book, I Believe In Santa Claus. Stop by and leave a comment for a chance to win. Merry Christmas. I love this idea! I hate wasting wrapping paper (even though I LOVE the look of it)...But, these turned out great & are green to boot! Too cute! Anyway, I found you via your comment on Lucky Star Lane. Thanks for coming by to check us out :) I'm following you now (but not in a creepy way :)! I'm all over this one!! Gorgeous wrapping! The contrast between the newspaper and the red and green embellishments is perfect! I am so in love with the newspaper idea! I have wrapped in the comics sections before but never thought about the main part--so pretty! I am in love with text! These presents look amazing...great idea!